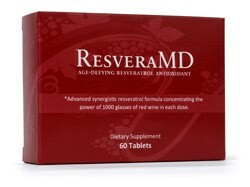 ResveraMD is a supplement that may deliver the heart-healthy benefits of resveratrol directly to you. The natural ingredients in ResveraMD might help improve your weight loss efforts and support heart health, all the while making you feel more energized than ever. ResveraMD is so easy to use that you only need one dose per day. Take two (2) capsules with a meal, once every 24 hours. This popular extract is found in the skin of red wine grapes and can also be found in Japanese knotweed. Resveratrol is believed to support a healthy metabolism and increase energy levels. Another popular plant in the news lately is acai berry. The reason it has received so much attention lately is because it is believed to be one of the most powerful sources of natural antioxidants found in the wild. Grapeseed is another antioxidant said to support healthy circulation and heart health. This ancient antioxidant has been used in Asia for thousands of years to support heart health. This antioxidant is found in many of the fruits, such as apples, and vegetables that are commonplace in the average diet. It is also believed to support a healthy heart. Ever hear of the “French Paradox?” It’s the observation that despite having an indulgent diet rich in fat, French people tend to have relatively good heart health and body weights. Why is that? It is speculated that red wine might be the answer. Particularly, an antioxidant found in red wine grapes called: resveratrol. Now you can get all the benefits of red wine - and other healthy foods - without the alcohol, calories or preservatives!